This was my first trip into the world of Thunderstrike. Thunderstrike is an off shoot of Thor about Eric Masterson, a former architect who once aided Thor in battle. For which he was gifted with an enchanted mace. So when Thor leaves Midgard he leaves Masterson as his replacement. At first his costume is an extremely gaudy version of Thor’s, but halfway through his costume changes to the sleeveless leather jacket version pictured on the cover. I personally prefer the later costume. I grabbed this on a whim to check out more of the fringe Thor titles. 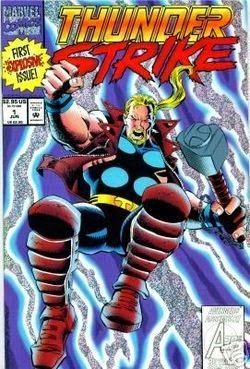 I had seen the issues of Thunderstrike before but always dismissed them because of the fact that he looks like a cheap knock off of Thor. This is a pretty straight forward issue that establishes the Thunderstrike character for the issues to come. Eric Masterson is flushed out really well along with a small group of supporting characters. DeFalco creates an interesting story from what could be seen as a throw away character. Frenz has an interesting style for this book. Even when Thunderstrike is wearing his overly large helmet with full face mask, Frenz makes him look believable. That said it is nineties Marvel house art, so it is not always great. I liked the issue on the whole, and I will probably pick up more issues when I can find them. That said it wasn’t the strongest issue I have ever read.